Turkey's ruling Justice and Development (AK) Party on Tuesday officially challenged poll results in all 39 districts of Istanbul, according to provincial head of the party on Tuesday. The AK Party also contested the election results in all 25 districts of the capital Ankara, submitting irregularities in 3,217 votes. 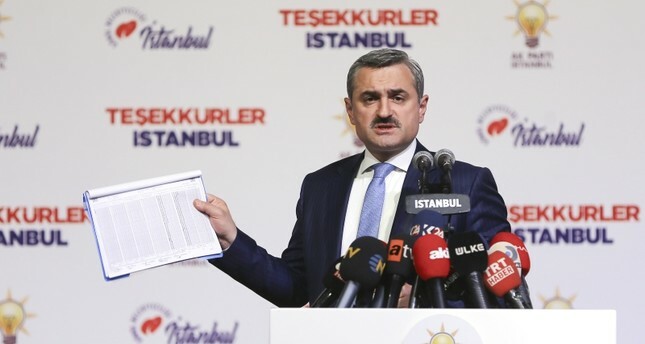 "We have detected significant discrepancies among the tabulated results with wet signatures and stamps -- which shows the first vote record -- the final record and the total number of votes submitted to the (Supreme Election Council) YSK," Bayram Şenocak, the Istanbul provincial head of AK Party told reporters. Şenocak said they submitted their documents at 3 p.m. local time (1200GMT) to contest the March 31 local election results in 39 districts of Istanbul. "We have detected rigs and irregularities that violate the legislation and a fair election environment from the start of the voting process," Şenocak said. Later on Tuesday, local election boards in Bayrampaşa, Beykoz, Çatalca, Çekmeköy, Fatih and Şile districts ruled for invalid votes to be recounted while a similar request was denied in Beyoğlu and Sancaktepe, where a recount request was partially granted over Republican People Party's (CHP) request. Devlet Bahçeli, chairman of the Nationalist Movement Party (MHP) which allied with the AK Party in the People's Alliance, said Tuesday that appealing the results of the elections is a legal right, adding that the results should be scrupulously examined. "If there are irregularities... it is absolutely necessary to repair and compensate for them," he said, adding that the MHP is following the process closely and believes that the YSK will act with the necessary reason to ensure fairness. He voiced his discontent with the unofficial results in the capital Ankara, where despite the People's Alliance gaining a majority of the district mayorships, the opposition National Alliance's candidate Mansur Yavaş appears to have secured the metropolitan municipal race. He said the same "imbalance" occurred in Istanbul, where the main opposition CHP candidate Ekrem Imamoğlu appears to have the upper hand. On Tuesday evening, AK Party Deputy Chairman Ali Ihsan Yavuz called the elections the "most questionable" in Turkey's history, saying they discovered many errors and irregularities. "I wouldn't be exaggerating if I called this election the most questionable in the history of our democracy. We noticed a large number of errors and irregularities after our initial inspections," Yavuz said. Millions of Turkish voters cast their votes nationwide Sunday in elections to choose Turkey's mayors, city council members, mukhtars (neighborhood officials) and members of elder councils for the next five years. In Istanbul, the victory has come down to about 23,000 votes, as Nation Alliance candidate CHP's Imamoğlu appears to lead the race for the Istanbul Metropolitan Municipality (IBB) against People's Alliance candidate the AK Party's Binali Yıldırım. On Monday, AK Party Deputy Chairman Numan Kurtulmuş said: "There are nearly 300,000 invalid votes (in Istanbul). In some districts, the share is very high. Our organization is preparing objections. Both us and the CHP are following the (the process)." In Ankara, unofficial results show CHP candidate Yavaş leading the race with 50.9 percent of votes, with the AK Party's Mehmet Özhaseki trailing at 47.1 percent. AK Party General Secretary Fatih Şahin said Monday, "We have identified invalid votes and irregularities in most of the 12,158 polling stations in Ankara." "We will use our legal rights to the fullest, and we will not allow the will of our citizens to be altered in Ankara," he added.